At some time in their second year, most babies take their first steps and become toddlers. The toddler period usually ends at age three and the child becomes a preschooler. Through play, toddlers learn language, social skills, personal awareness, creativity, problem-solving and control of their body movements. If toddlers are given interesting toys and materials to play with and opportunities for movement and exercise, they will learn easily and quickly. Much of their play will revolve around an adult, who provides the tools and activities to support and extend their learning. 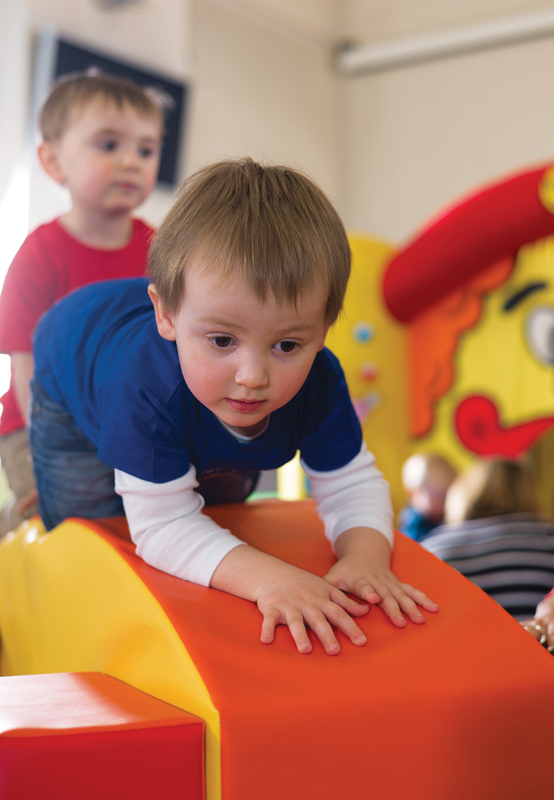 The following activities will meet the learning and developmental needs of toddlers and engage their interest. All are suitable for the home or the nursery. Toddlers learn about the world by engaging in hands-on activities which stimulate their senses. The home or nursery offers a wealth of opportunities for sensory play from washing clothes, to matching socks, dusting, pouring drinks, preparing food, setting the table, washing up and sweeping up leaves. Involving toddlers in household chores provides an ideal opportunity to encourage language development and social skills. It also gives toddlers the chance to model adult behaviour and to act out real-life situations. If they are praised for their efforts, they are more likely to want to help again. A plastic tea set and play food are great toys for toddlers. They can set out the dishes, fill them with food, match lids to pots, and pretend to feed their teddy bears. 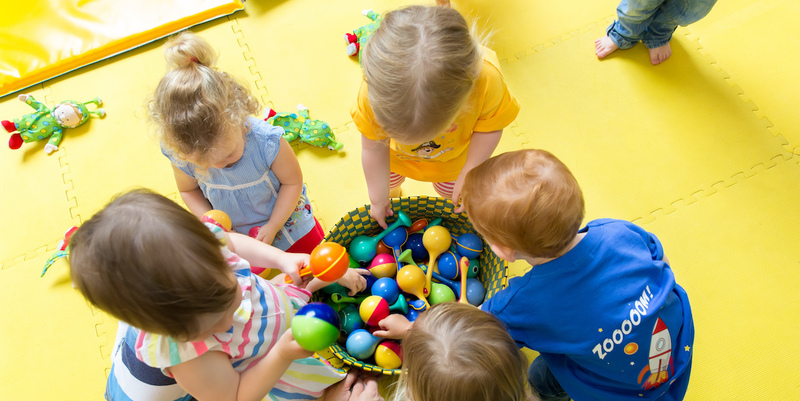 The play encourages toddlers to sort and group objects and to explore and handle different objects. Kitchen cups and containers that can be stacked, nested or used as hiding places for toys are also fun to play with. As toddlers handle the containers, they learn about size and space, which forms the foundation for mathematical and spatial awareness. Hide and seek is one of the best activities for toddlers because it covers all the developmental areas. It is also simple to organise and lots of fun. The simplest game involves hiding behind the sofa or under the table. Toddlers may feel frightened if they are unable to find the adult, but making noises and movements helps to reduce anxiety. To enhance listening skills, hide an egg-timer. Toddlers will be able to detect the ticking noise as they get close to the sound. When the object is discovered, the concept of object permanence, the awareness that things continue to exist even when they disappear from sight, will be reinforced. Toddlers may deliberately prolong the fun by hiding the object for the adult to discover. An outdoor treasure hunt provides an ideal opportunity to get toddlers out in the fresh air and sunshine. Soft toys are safer to hide than hard ones, which can cause injury if the toddler gets excited and falls over. Using position words such as ‘under’, ‘in’ and ‘behind’ helps to increase vocabulary and understanding. A handbag filled with safe items encourages exploration. If the bag has flaps, straps or a zip, these can be grabbed, pulled apart, opened and closed to develop fine motor skills. As each item is explored, the adult can name it and explain what it might be used for. Changing the contents regularly will provide an endless source of interest and amusement. Later on, the bag can be used for make-believe and imaginative play. An empty box will keep toddlers happily entertained for hours. Many toddlers enjoy fitting themselves into boxes that are just their size, which promotes spatial awareness. When the box is transformed into a pirate ship, a train or a fort, the adult gets to see the world from the toddler’s point of view. Sand play provides a therapeutic tool for expressing thoughts, feelings and constructive language. As toddlers explore wet and dry sand, make structures and transfer it from one container to another, they learn about stability, texture and quality. Sand play also encourages social relationships with other children as they play alongside them. Water offers a wide range of learning opportunities for toddlers. Pouring water from one vessel to another develops hand-eye coordination and upper arm muscle strength (a litre of water weighs a kilo). To enrich vocabulary, use the words ‘full’ ‘empty’ and ‘liquid’. When water is poured into different vessels, the toddler will see the levels change, which increases awareness of volume and capacity. A sponge, a ping-pong ball and objects with different properties will promote the development of many science concepts such as floating and sinking. When the adult joins in, the play becomes an interactive social experience. When the pincer grip has been mastered, toddlers enjoy threading dry pasta and Oshaped breakfast cereal on a plastic cord. The activity encourages concentration and it improves hand-eye coordination. Crumpling paper and tearing the wrapping from a parcel stimulates curiosity, manipulation, exploration and an understanding of object permanence. As fine motor skills improve, toddlers delight in wrapping up their favourite toys for further discovery. Colouring books and crayons encourage toddlers to scribble or make marks on paper and leads on to later writing. If crayons are a problem, try an ‘Etch A Sketch’. Toddlers can draw on the wipe-off mat with the magic pencil and start again without having to change the paper. Being able to fit something together can be a very satisfying experience for toddlers. Adults can encourage descriptive language such as “What colour is this block?” and ‘What do you think will happen if the tower gets any bigger?” Building with blocks and interlinking plastic shapes develops awareness of size, form, weight, dimension and order and lays the foundation for mathematics. Toddlers also enjoy demolishing their constructions, which relieves stress and tension, and teaches them something about cause and effect at the same time. Painting can be a relaxing and soothing experience for toddlers, and a means of selfexpression. Simply holding a paint brush develops control over hands and upper arms. Toddlers will discover how colours are mixed to make new ones, which can lead learning forwards in a very positive way. Play dough or bread dough provides a complete sensory experience and helps toddlers to feel in control. They enjoy the sensation of twisting, stretching, cutting and rolling the dough, which encourages fine motor skills and hand-eye coordination. Toddlers are naturally inclined to move their bodies to music with a strong beat and dancing is an excellent way to work in some physical activity. Dancing builds muscle memory and encourages them to express their emotions. Pom-poms, scarves and ribbons can add a new dimension to dancing, especially if the adult joins in with the fun. An inflatable bed or a bouncy castle challenges balancing skills and introduces a sense of excitement. Bouncing also provides a natural opportunity for emotional and social growth, which in turn, provides the building blocks for future learning. A ball is one of the best ways to get toddlers moving. It can be bounced, thrown at a target, kicked, caught or rolled down a slope. Tracking the movement of the ball improves eyesight, which is essential for later reading. A garden or outdoor space provides the perfect opportunity for toddlers to get out and about in the fresh air. Fresh air contains high levels of negative ions that can have a positive impact on health and brain function. Sunlight provides Vitamin D that children need to grow strong, healthy bones and offers protection from a number of common ailments and disorders. The fresh air, exercise and sunlight will also ensure that toddlers sleep soundly at the end of the day. An outing to the pond to see the ducks, a trip to a farm or zoo or a walk in the park without the pushchair, will encourage mobility skills. 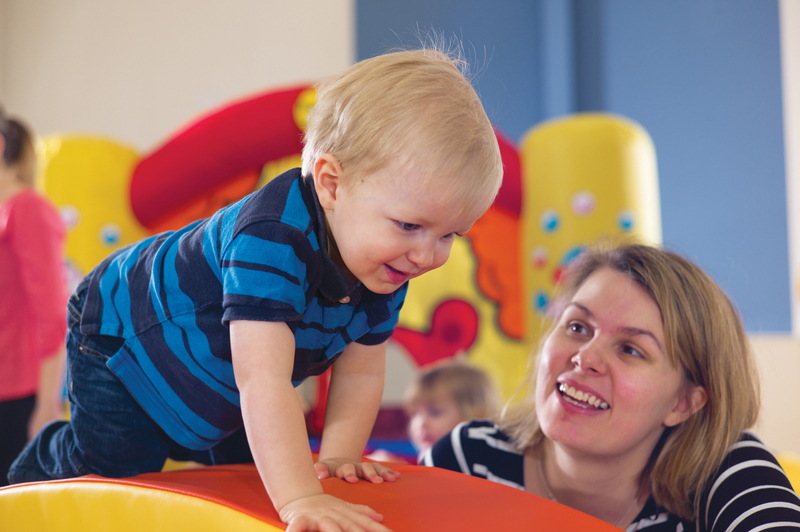 On a wet day, an indoor adventure playground provides a great opportunity for toddlers to exercise and build up muscle strength, balance and coordination. However, toddlers can have just as much fun climbing over cushions and pillows in the nursery or the home. Toddlers enjoy books with large, brightly coloured illustrations, textured materials and hide-and-seek pictures, which invite speech and interaction. The properties of a texture can be investigated with their finger tips and the pages can be turned to discover something new. Books encourage toddlers to recognise simple objects and animals. They may be able to repeat the sounds that the animals make or act out the actions. Books with a repetitive theme such as ‘Walking through the Jungle’ by Debbie Harter and ‘We’re Going on a Bear Hunt’ by Michel Rosen and Helen Oxenbury will enable toddlers to participate and ask questions. Humorous stories such as ‘Click, Clack, Moo; Cows that type’ by Doreen Corin and Betsy Lewin will stretch their imaginations and help them to appreciate the joy and pleasure that can be found in books. Traditional songs such as ‘Wind the bobbin up’ and ‘Head and Shoulders’ have delighted toddlers for generations and are a fun way to develop language skills and sensory awareness. Repeating the words reinforces memory and echoing the actions helps toddlers to control their movements. Sing and sign books and music CDs, which invite adult-child interactions such as ‘Say Hello to the Sun’ and the ‘ABC of Baby Signing’ by Dr Lin Day, make learning and communication fun. Rhymes and songs that involve puppets can provide a wealth of learning and development opportunities from visual stimulation to imagination and speech development. They also encourage rich adult-child interactions and the element of surprise that toddlers love so much. At the end of a busy day, toddlers need to wind down. An educational DVD offers an opportunity for close physical contact, which has a huge impact on learning and development. High quality educational programmes can provide a window on the world for toddlers and help them to make sense of it. Some educational programmes can inspire an outing to the park or a messy play activity the following day. Safety is a crucial aspect of play. Toddlers have an innate desire to be mobile and to explore, but this means that adults need to be extra cautious about their safety. Play is an essential part of growing up. 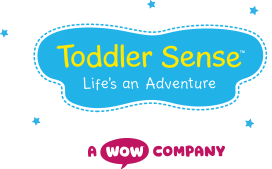 It helps toddlers find out about the world in which they live and it builds essential learning and development skills. Play with an adult builds social and language skills and provides the emotional security that toddlers need for healthy development. The adult also provides activities which extend learning and ensures that the play is safe.